Whether it’s a five-course meal one labours over or just a quick fix to satisfy an impulsive craving, some bachelors have a special relationship with their kitchen. We present this clean setting, predominantly in green, grey and white, along with an exclusive breakfast table. 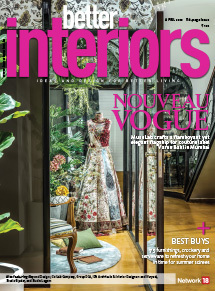 From innovative whisks and glossy egg trays (just because) to elegant tableware and an impeccably designed modular kitchen, this one is a feast for your senses. 1 Chop up some fresh veggies or fruits and serve them in these simple-yet-classy ivory ceramic bowls; Rs. 1,020 (each); PURE HOME + LIVING. 2 Eggs can now safely sit together in this glossy black ceramic Egg Basket. Also available in purple, this tray can hold two dozen eggs; Rs. 1,700; LE MILL. 3 What’s a hearty breakfast without some freshly squeezed juice? 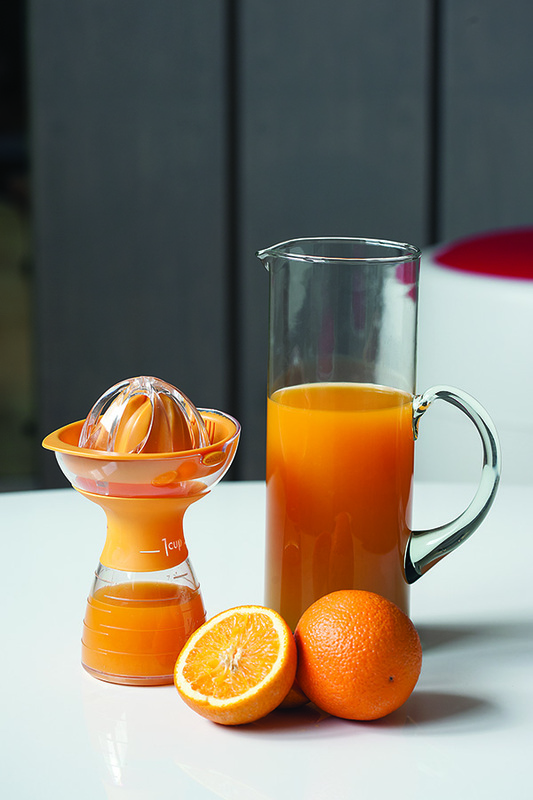 This ergonomically designed plastic Chef ‘n Juicester Citrus Juicer, with stainless-steel blades, will complete your morning feasting experience; Rs. 1,100; HOME COLLECTIVE. 4 The La Mediterranea cylindrical jug, made from recycled glass, is a stylish way to store and serve a glass of juice; Rs. 2,190; LE MILL. 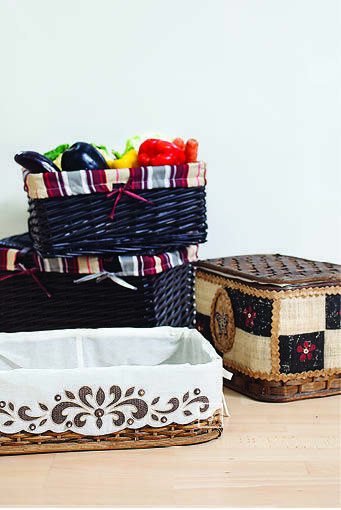 5 These Split Bamboo Weave Wicker baskets can be used for multiple purposes. Store your vegetables, fruits, laundry… or carry goodies for a picnic; Rs. 495 to Rs. 2800; HOME CENTRE. 6 Medium-sized coffee mugs are an essential part of every kitchen. 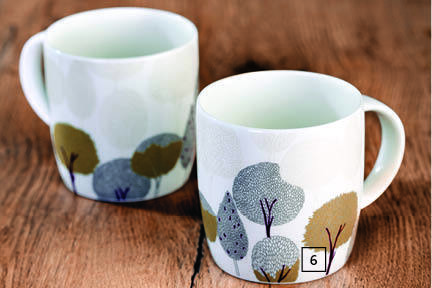 Whether you’re burning the midnight oil or need a shot of caffeine every morning, these fine bone china mugs will play the part to perfection; Rs. 250 (each); HOME CENTRE. 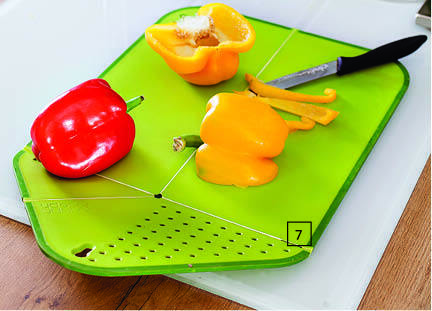 7 & 8 This green Rinse & Chop Chopping Board made from polypropylene is rather cool. Use the board to cut your veggies… fold it in the middle and viola, you have a colander to wash them in; Rs. 1,649; HOUSE PROUD. 9 Ever had your omelette go to pieces on you for the lack of a big spatula? 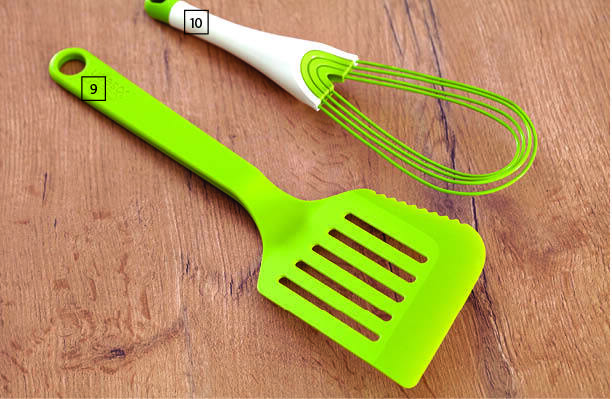 Fear not… the Jumbo Turner spatula, made from toughened nylon, makes handling large or awkward food super easy. This creation can resist heat up to 2400 C; Rs. 849; HOUSE PROUD. 10 The unique Twist Whisk brings fun design together with functionality. It incorporates two whisks in one design. The silicone-coated steel wires are ideal for mixing sauces in pans, scraping and blending ingredients together; Rs. 1,249; HOUSE PROUD. 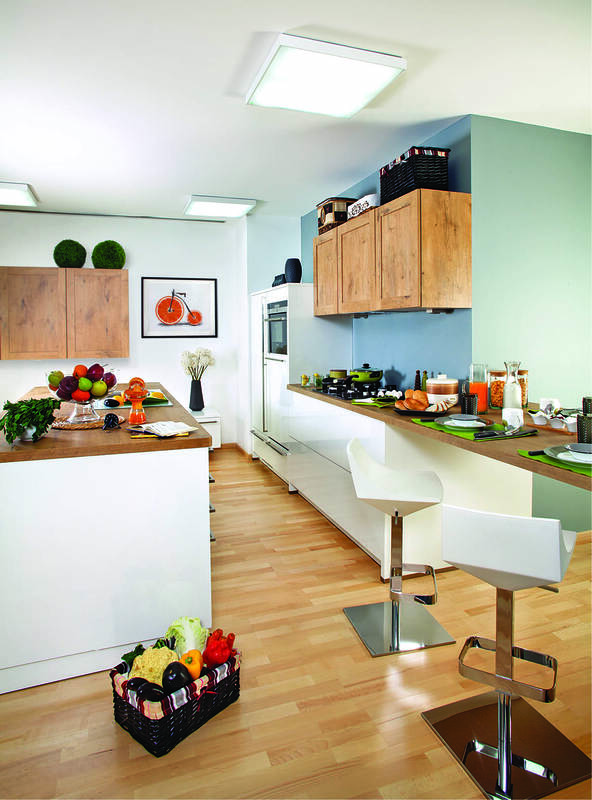 11 This uber-stylish modular kitchen has a solid wood finish with white lacquer, which is both, food and child-safe. It has travelled all the way from Germany and boasts of appliances such as the cooking hob, combi-steam oven, dishwasher and a refrigerator from Siemens; hardware from Blum and a built-in chimney by the SEA group. 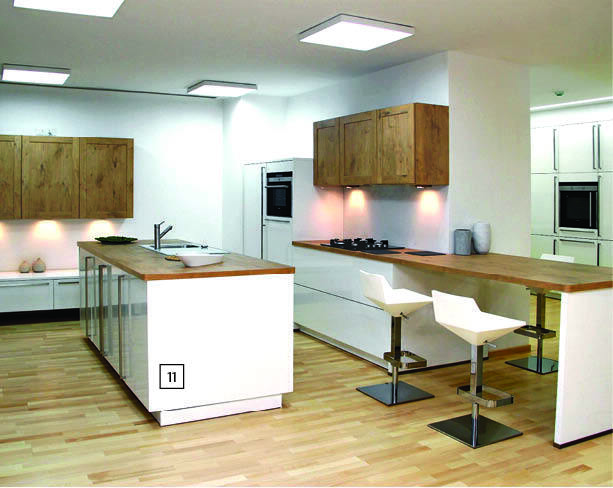 With LED backlights and downlights (which are integrated during the furniture-making itself), these kitchens are 100 per cent recyclable and are made from FSC-certified wood; SEA BAUFORMAT. 12 Love your dumplings steaming hot? Then the Jia Inc ceramic steamer is a must-buy. It can be placed directly on the stove; Rs. 6,500; LE MILL. 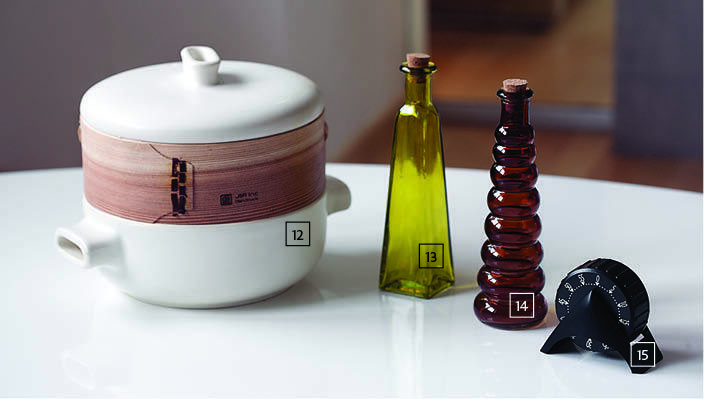 13 & 14 If you’ve been scouring the market for the right bottle to store your oils, we just made it quick and stress-free for you. Geraldine Deco Glass Bottles come in multiple colours and make for ideal storage for oil and vinegar; Rs. 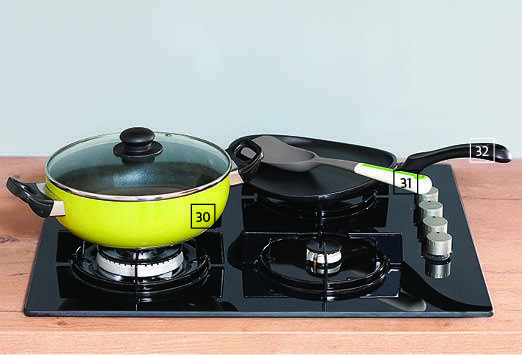 400 (set of four); HOME CENTRE. 15 Multi-tasking is the only way to stay on top of the game in the mad morning rush to grab breakfast and get to office on time. 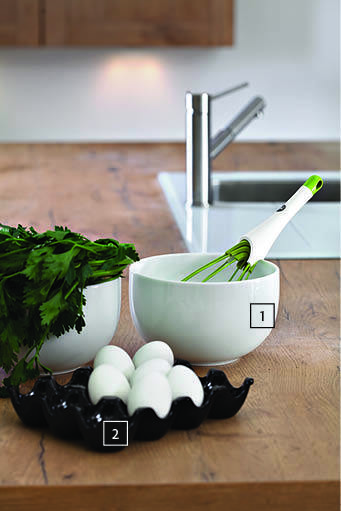 The Rosti Kitchen Timer helps you keep track of that perfect three-minute egg while you take a pick from your wardrobe; Rs. 725; HOME COLLECTIVE. 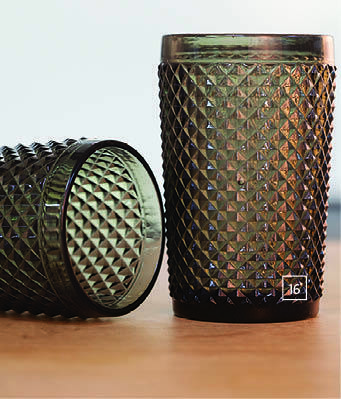 16 They’re translucent, black and have pretty corrugated pattern… the refractive surface of these elegant glasses will catch the morning sunlight while you drink up your dose of vitamin; Rs. 175 (each); PURE HOME + LIVING. 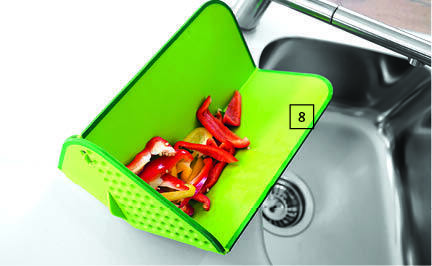 17, 18 & 19 The right kind of storage is an absolute must for a clean, fresh and hygienic kitchen. 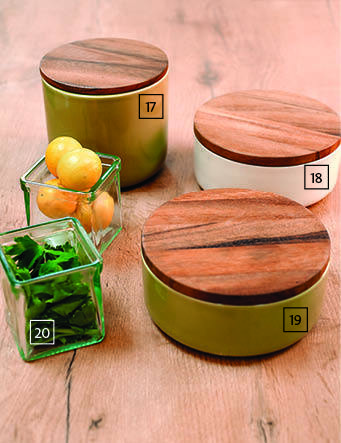 These sleek and super convenient ceramic storage boxes in ivory and olive green will help with just that; Rs. 750; PURE HOME + LIVING. 20 These thoughtful clear square containers made from recycled glass come in handy for storing tiny ingredients in the kitchen; Rs. 320 (each); LE MILL. 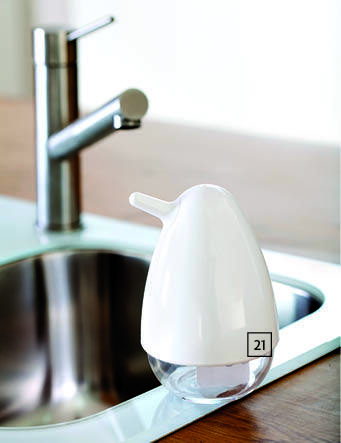 21 The adorable white Birdie Foam Pump converts liquid soap into foam while dispensing. The see-through base tells you when it’s time for a top-up; Rs. 1,649; HOUSE PROUD. 22 & 23 They’re medium-sized and come in handy for storing crunchy ingredients. The Mediterranea Cylindrical Cork Jars are made from recycled glass and come with a cork lid, which helps keeping the food fresh for long. They’re ideal for storing your breakfast cereal; Rs. 1,290 (each); LE MILL. 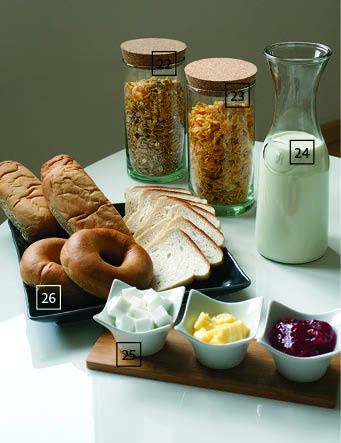 24 This Glass Milk bottle can also be used to dispense juice or soda… whatever you prefer; Rs. 100; HOME CENTRE. 25 Serve up some yummy jams, butter or even chutneys in this three porcelain sauce dip set, which comes with a bamboo plate; Rs. 300; HOME CENTRE. 26 Add a touch of drop-dead-gorgeousness to your table with this beautiful ceramic grey platter. It even has a pretty floral embossing for added effect. Whether you serve some freshly baked, hot breads in it or even use it for dinner, its charm will never wear out; Rs. 630; FABINDIA. 27 A dash of floral elements never harmed anyone. These Single Flocked Allium Stems, made from polyester, plastic, PVC and a metal wire, are a great way to add a touch of freshness to any space; Rs. 250 (each); HOME CENTRE. 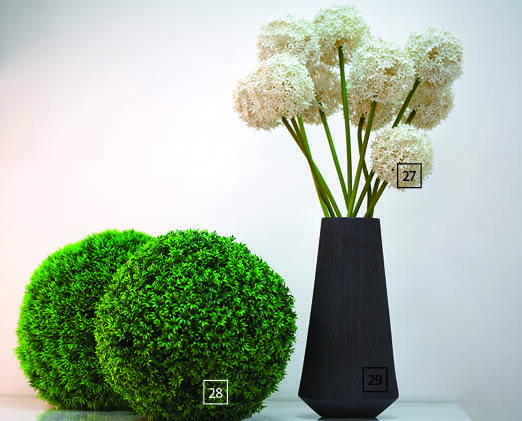 28 The Fir Grass Ball (33 cm diameter) and the Monochoria Ball (30 cm diameter) are an ideal alternative for indoor plants; Rs. 1,430 and Rs. 1,400 respectively; PURE HOME + LIVNG. draw your attention; Rs. 1,950; PURE HOME + LIVING. 30 This green non-stick kadai is ideal for some low-oil, healthy cooking; Rs. 1050; HOME CENTRE. 31 The FreshForce Small Scoop Turner is made from nylon and plastic and sports a flexible head. This innovative feature makes it easy to scoop the food; Rs. 512; HOME COLLECTIVE. 32 Because your pancakes are not always the perfect shape, this non-stick wavy egg pan is a reassuring addition to your kitchen; Rs. 2,020; HOME COLLECTIVE. 33 This adorable salt and pepper grinder set combines durable ceramic with adjustable grind. Easy to use, it has a removable base for a refill; Rs. 1,000 (each); HOME COLLECTIVE. 34 The platinum coloured rim of this sophisticated dinner plate adds quiet class to the setting; Rs. 990 (each); PURE HOME + LIVING. 35 Kick-start your day with style… eat your power-packed cereal or some freshly chopped fruits in this grey-rimmed enamel bowl. It even goes perfectly with the plate; Rs. 1,000 (each); LE MILL. 36 This set of simple grey cotton napkins will complement any setting with ease; Rs. 590 (set of six); FABINDIA. 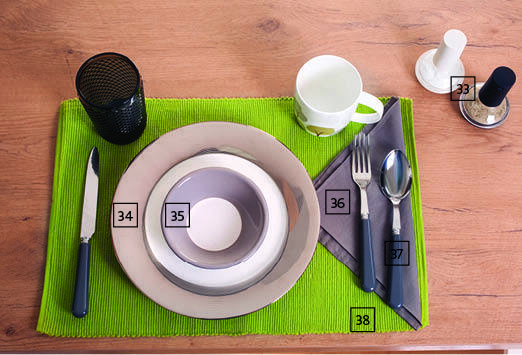 38 The green table mat, made of woven cotton, brightens up the table instantly. Rs. 490 (set of six); FABINDIA. 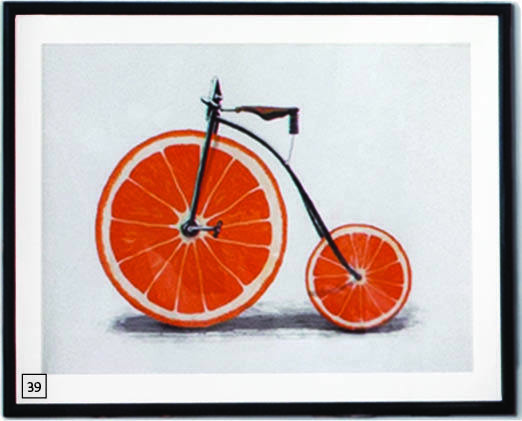 39 The extra large framed print of this cheerful orange bicycle on the wall print, aptly called Vitamin, is by France-based artist Speakerine. Created using archival inks on acid-free paper and framed with a sturdy black frame made from fibre, it comes in a size of 27.5 in x 34.5 in; Rs. 8,100; CRUDE AREA.